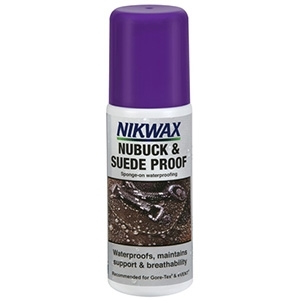 Nikwax Nubuck & Suede Proof™ is easy and quick to apply; either spray or sponge on to wet boots. Nikwax Nubuck & Suede Proof™ provides highly Durable Water Repellency (DWR) which develops on air drying. It leaves a flexible water repellent treatment on individual fibres of nubuck and suede. This allows moisture vapour to pass through, maintaining breathability and keeping your feet dry. Nikwax Nubuck & Suede Proof™ has been specifically designed and optimised for nubuck and suede combination footwear and will maintain the texture of the materials.